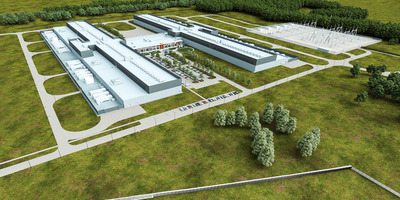 FacebookA rendering from Facebook of the planned Huntsville, Alabama data center. Facebook announced plans to build a new $US750 million data center in Alabama. The 970,000-square-foot facility will create 100 new jobs and be operational by 2020. It joins Facebook’s sprawling network of data centres doted across the US and around the world. Facebook has got big plans for a new $US750 million data center in Huntsville, Alabama. A Facebook spokesperson confirmed to Business Insider that it is investing $US750 million in the project. The Birmingham Business Journal previously reported Alabama governor Kay Ivey as saying the average salary at the completed center will be $US80,000, and it will create 100 new jobs. The new Huntsville facility will join Facebook’s sprawling network of data centres across America and around the world, that host its reams of user data and power its apps and services.The company now builds and open-sources its own data center hardware through the Open Compute Project, an initiative to make data center designs freely available to engineers – and underming the traditional server industry in the process. It should be up and running by 2020, Facebook said. But it’s not only about the impact online, we are also committed to having a positive impact on this community. These data centres are real economic engines – and beyond just the four corners of the site. We are proud to say a recent study found that for every 1 million dollars in operating expenses at our data centres, there are 13 jobs supported in the economy. And for every 1 million dollars in capital expenditures, there are more than 14 jobs supported in the economy. Facebook is also committed to powering our data centres with 100% clean and renewable energy. That is why we worked with the Tennessee Valley Authority to establish a renewable energy tariff that will let qualifying customers, not just Facebook, buy new renewable resources. We are also working closely with them to identify new solar projects in the area that will power 100% of our facility. Over the coming years, we will continue to work on the foundational technologies needed to bring the world closer together – and the Huntsville Data Center will be a part of that.